We recognise that without the contribution of volunteers, we would only be able to achieve a small percentage of our work. We want you to clearly see the difference that your volunteering makes to the lives of people affected by MS.
We celebrate and reward the hard work and dedication of people who make a difference in the MS community. Sending a thank you card is a quick and easy way to make your volunteers feel valued and appreciated. You can order free of charge thank you cards from our Online Shop. This certificate acknowledges a volunteer contribution made to your group. Your Coordinating Team decides who receives a certificate of appreciation and how frequently you award them. This lapel pin and certificate recognises outstanding individual or group contributions by volunteers. Any volunteer can nominate a worthy volunteer or group of volunteers to be recognised with a Shining Star award. Each year, we hold a star studded celebration of the MS community. 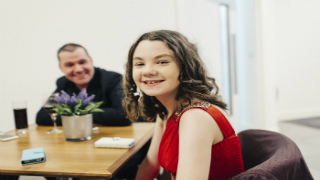 MS Society Awards are presented to extraordinary carers and young carers, volunteers and groups, fundraisers and campaigners, employers and journalists, and professionals and scientists. Our resources are finite and we need to be an effective and efficient organisation to meet our goals. Sharing our successes and challenges helps all of us to do better. We want you to keep in touch with your staff contact so they can use your experience to support other groups and projects. We are committed to understanding the impact of volunteering, locally and nationally. This includes the impact on people who use our services, on our volunteers’ development and wellbeing, and on wider society. Understanding our impact helps us attract funding, identify what works and showcase our achievements. If your group provides services and activities, your Local Networks Officer is available to help you recognise your team’s contribution. If you are part of a dedicated Fundraising Group, contact your Area Fundraiser for support.